World Weather Attribution (WWA) presents a quantitative study of this cold air outbreak. WWA researchers compute how rare the outbreak was and how it is affected by human-caused greenhouse gases. The analysis uses the same methods as WWA used in the peer-reviewed analysis of the cold extremes in the Midwest in the winter of 2013 – 2014 (van Oldenborgh et al, 2015). Guest post by Geert Jan van Oldenborgh (KNMI). First, what is going on? 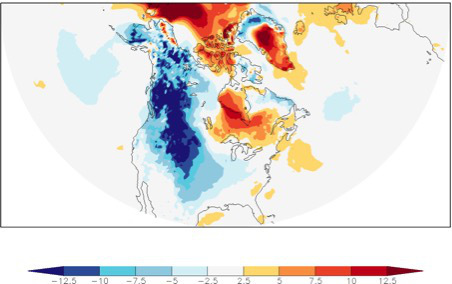 The map below (Fig.1a) shows the daily mean temperature forecast for December 8th compared to the 1981–2010 average. Cold air (blue) is seen to flow south from Alaska down to the Rocky Mountains. The map highlights the day the coldest air extends farthest south. Fig. 1a: This map shows daily mean ECMWF 1-day temperature forecast for December 8, 2016 compared to the 1981–2010 average of ERA-interim reanalysis. A few days later the cold air was forecast to reach all the way down to the Southeast as shown below (Fig.1b), but with less intensity. Western Canada remained cold throughout. Fig.1b. This map shows daily mean ECMWF 1-day temperature forecast for December 10, 2016 compared to the 1981–2010 average of ERA-interim reanalysis. Such “cold air outbreaks” are a common occurrence in winter in North America. To determine how rare such an event is we consider two stations that are forecast to be in the center of the cold weather: Boulder, Colorado and New Orleans, Louisiana. Both these stations have daily observations going back to 1893, albeit with a few missing years. The Boulder forecast for daily mean temperature on 8 December was 3.9ºF (-15.6 ºC). This is definitely a cold day, but not very unusual there: the coldest day of the winter is on average 3.4ºF (-15.9 ºC). Almost every other year has a day that is colder than the forecast. There is a positive trend in the temperature of the coldest day in the year (Fig. 2), but because of the big differences in weather from year to year it is not significantly different from zero. Fig. 2: Daily mean temperature of the coldest day of the year in Boulder, Colorado. The x-axis is the smoothed global mean surface temperature anomaly relative to 1951–1980 (GISTEMP). The purple square denotes the forecast for 8 December 2016. (Note: we do not know yet whether the December 8 value represents the coldest day of the 2016/17 winter, it is shown for comparison only.) The thick red line denotes a fit to a GEV function (excluding 2016) that shifts with the smoothed global mean surface temperature, thin lines denote the width of this distribution. The vertical bars give the 95% confidence interval in 1900 and 2016. The positive trend is not significantly different from zero but of the expected sign and magnitude for a response to global warming. In New Orleans (Fig 3), the forecast for 10 December was a daily mean temperature of just 45ºF (7.2 ºC). This is nothing unusual, it gets colder than that every winter. The coldest day of the year there has a very significant upward trend: cold extremes are now on average 3.2ºF (1.8 ºC) warmer than they were a century ago. Fig. 3: Daily mean temperature of the coldest day of the year in New Orleans. The X-axis is the smoothed global mean surface temperature anomaly relative to 1951–1980 (GISTEMP). The purple square denotes the forecast for December 8, 2016. (Note that the December 8th value is very unlikely to represent the coldest day of the 2016/17 winter, it is shown for comparison only.) The thick red line denotes a fit to a GEV function (excluding 2016) that shifts with the smoothed global mean surface temperature, thin lines denote the width of this distribution. The vertical bars give the 95% confidence interval in 1900 and 2016. The trend is significantly different from zero and agrees with what we expect from global warming. Cold air outbreaks are influenced by two main factors (de Vries et al, 2012): the frequency and intensity of cold northerly winds, and the temperature of the cold air from the Arctic. There are no indications that we are getting more, stronger or more persistent northerlies above the large variability from winter to winter (Screen & Simmonds 2013), whereas observations show that the temperature of the source regions of the cold air is increasing rapidly (Screen, 2014; van Oldenborgh et al, 2015). Climate models confirm this analysis, showing a strong warming trend in coldest day of the year in the mid-latitudes. In these models this also reflects the strong warming of the Arctic. They also show little influence of the sea ice extent on the circulation over North America. While some research suggests that cold air outbreaks could have become more frequent as a result of melting Arctic sea ice (Francis and Vavrus, 2012), the majority of studies find no influence of sea ice at all (e.g., references in Jung et al, 2015). A recent paper by Screen et al (2015) finds that decreasing sea-ice cover results in fewer cold extremes over central and eastern North America. That said, there is some evidence for the sea ice decline strengthening the Siberian high somewhat (Mori et al, 2014) leading to colder extremes in that region (Screen et al, 2015). In conclusion: the cold air outbreak forecast was nothing unusual, and neither inconsistent with an overall picture of a warming world, nor evidence that global warming is making cold weather more extreme. Such cold air outbreaks are, in fact, decreasing in intensity both in observations and climate models primarily because the source of the cold air, the Arctic, is warming strongly. Note: This post first appeared at Climate Central and will hopefully be the first in a regular series on event attribution. Francis, J. A., and S. J. Vavrus, 2012. Evidence linking Arctic amplification to extreme weather in mid-latitudes, Geophys. Res. Lett., 39, L06801. Jung, Th. et al, 2015. Polar lower-latitude linkages and their role in weather and climate prediction, Bull. Amer. Meteor. Soc., 96, ES197–ES200. Mori, M., M. Watanabe, H. Shiogama, J. Inoue and M. Kimoto, 2014. Robust Arctic sea-ice influence on the frequent Eurasian cold winters in past decades, Nature Geosci. 7, 869–873. van Oldenborgh, G. J., R. Haarsma, H. de Vries and M. Allen, 2015. 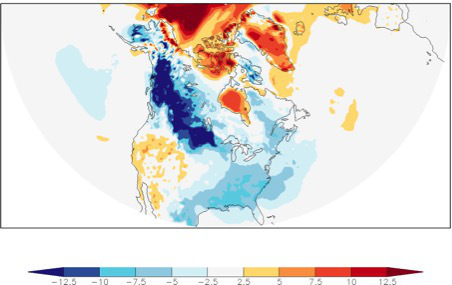 Cold extremes in North America vs. mild weather in Europe: the winter of 2013–14 in the context of a Warming World, Bull. Amer. Meteor. Soc., 96, 707714. Screen, J. A. and AI. Simmonds, 2013. Exploring links between Arctic amplification and mid-latitude weather, Geophys. Res. Lett., 40, 959–964. Screen, J.A., 2014. Arctic amplification decreases temperature variance in northern mid- to high-latitudes, Nature Clim. Change, 4, 577–582. Screen, J. A., C. Deser and L. Sun, 2015. Projected changes in regional climate extremes arising from Arctic sea ice loss . Environ. Res. Lett., 10, 084006.
de Vries, H., R. Haarsma and W. Hazeleger, 2012. Western European cold spells in current and future climate, Geophys. Res. Lett., 39, L04706.